Hello and welcome back to another edition of Sealed Success! It's been a few weeks since I've last written and I'm glad to be back in the fold. Shortly thereafter last week's article I began to feel unwell and I eventually lost my voice for a few days, making it unable for me to record any content. The following week I was healthy enough to resume recording but as I went to upload my videos I noticed the screen had been blacked out for the match portions of the draft. At this point I wasn't going to be able to do any sort of recording in time so I decided to leave it be and try again next week. I did not want to do replays for the draft so I thought it best to record a new draft and have live commentary as I play the matches. Ravnica Weekend has already passed us but I do want to take a moment to talk about the 4 pack draft I did during the weekend. The draft was a little unusual as we did 2 pods of 10 with league style play, so not only did we have an extra pack to draft from, we had two extra players per pod to add cards to the pool. 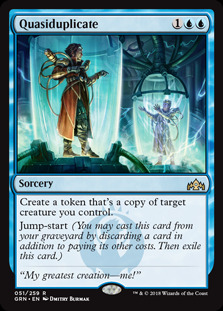 When you add more players to a draft pod you end up receiving weird signals as the further you get into a pack the more likely you'll see something in your color(s), and it's less likely you'll be able to table a specific card. Basic draft theory still works here but there's a little more room for error in terms of sending/receiving signals, and it's more likely someone switches colors after pack 1. 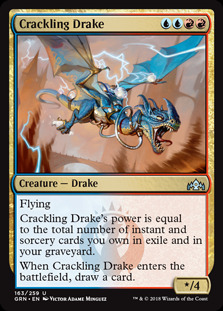 I opened a Crackling Drake early and took it knowing Izzet is likely to be underdrafted since it's not always a straight forward deck to play. 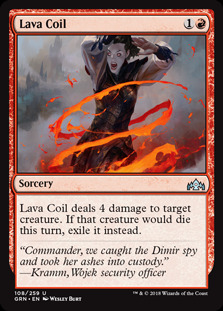 I liked drafting Izzet as a tempo deck in Return to Ravnica draft and I do the same here in Guilds of Ravnica. Red Mentor cards plus blue fliers are how I like to draft Izzet and it works very well if you know how to play it. I had quite a strong deck with multiple Crackling Drake , Citywatch Sphinx , and a Quasiduplicate to make myself a potent aerial force. Sadly I went 2-2 over the course of the matches losing a good match against Boros and another match due to mana issues. It was a fun event all around and the decks people were playing seemed to have a much higher power level than normal decks, which is what I expected to happen given the extra pack. With that in mind I saw the decks that were losing early were the ones which didn't understand everyone had a stronger deck and drafted normally. When you draft in a format which has a higher than average power level you need to draft accordingly and not end up with an average deck after the draft is done. While it's possible for you to steal games with tight play and some luck, it's more likely you'll lose to a player who drafted a higher quality deck than you did. This logic applies to Masters sets and Cube drafts: when everyone has good cards, make sure your cards are as good as theirs. Looking back at the first pack of the draft I don't feel I made any glaring mistakes, and the only reason it feels as though I made mistakes was because pack 2 had me being fed a lot of red cards when I didn't see too many of the in pack 1. 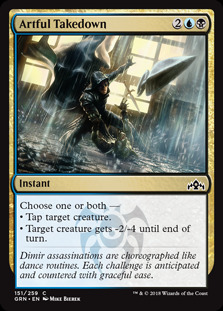 By the time I wanted to take a look at red it wasn't there and I started to take black cards, leaving me with a base Dimir/Golgari build as opposed to Izzet. Now, perhaps I should have switched to Izzet in pack 2 by taking the red cards being passed to me and I will admit I could have easily dropped black/green and drafted Izzet from that point on. 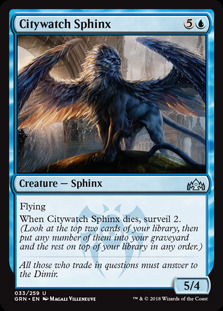 Given what I saw in pack 1 I was hesitant to make that switch and so I stayed in a Dimir/Golgari base which ended up turning into a Golgari deck with a blue splash for Citywatch Sphinx and Artful Takedown . I ended the draft with a 1-2 record and I deserved the record given how I drafted this deck. My deck had no real synergy due to me not utilizing Undergrowth to its full capability, and so I had a bunch of cards which worked fine on their own but not so well when combined. The Arboretum Elememtal s in my deck felt weak since I had to mostly pay full price for them and at 8-9 mana they're not so great to cast. I should have replaced one of them with Siege Wurm just so I don't have both of them stranded in my hand as I did in some games. I said earlier you need to draft better than average decks in a format where you have a good/above average power level and this is evidence proving if you don't you won't be able to succeed. My deck was mostly filled with random creatures, had no game plan, and was lacking in removal options. It's a bit of a miracle I won a match at all. We won this match pretty easily after dropping the first game and it didn't feel as though we played an actual match when both of us got destroyed in one of the games. The only real game happened in game 2 and I was able to navigate it in such a way to were I took the game. 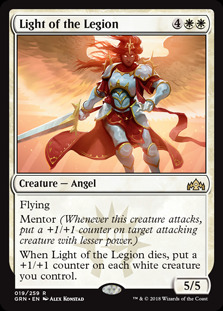 I did keep a bit of a sketchy hand in game 1 but Boros isn't a deck that mulligans too well and the way the deck was situated I need as many resources as possible to get free early damage so I can close it out with Aurelia or Light of the Legion if I need to. Mulligans do hinder my ability to get in damage quickly and I felt I had good enough odds to hit something by turn 3 (either red source, land, or 1-2 mana play). I was not expecting to be 1-2 after the first stage but mana issues led to my downfall in both matches I lost. It's always unfortunate to lose to either mana screw/flood but it's a part of the game and we have to accept its existence and embrace it. We can mitigate variance as much as we want but the thing with percentages is unless it's 100% there's always a chance you get hit by the wrong side of chance. I know I say it week after week but it has to be a mantra because for some of us it's hard to innately understand and accept the variance in the game. While I believe myself to not get tilted by variance, I don't want to give myself any opportunity to get mad or upset because something didn't go my way. If I remind myself every time it happens that it's part of the game and I know it exists, then losing in that manner doesn't affect me negatively. Now, I won't blame all my losses to variance, but when it is reasonable I will attribute my losing to it and pay it no mind. Despite the losing the deck does perform well and it is a quality deck even with a 1-2 record. The red splash can be a liability at times so I'm going to play straight Selesnya for each game unless I feel the reason to include the red splash for Justice Strike and Lava Coil . 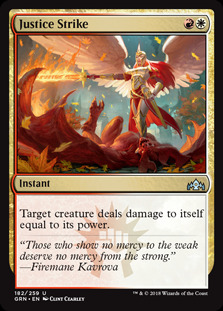 Splashing for removal is good when you don't have removal to begin with, but since I do there's no reason to make my mana worse to add only a negligible percentage to win rate. What do you think? Should I keep in the red splash or no? Not a whole of winning this week but some of it was out of our control and there's nothing you can do about that. I do need to draft better and make sure my decks have a game plan otherwise I'm going to repeat 1-2 results every draft unless I make a change. We'll start attempting to make that change next week with another draft and a new slate of matches to play. If you have any comments, questions, or concerns please leave them in the comments section below. You can subscribe to my YouTube channel here where you can find all my matches uploaded early, along with additional content whenever I have the time to make it.